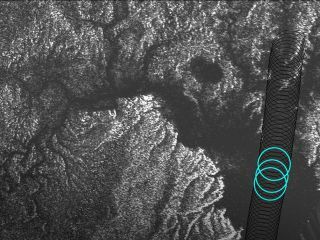 Kraken Mare, the biggest hydrocarbon sea on Saturn's huge moon Titan, is at least 115 feet (35 meters) deep and perhaps much deeper, a new study suggests. Radar measurements made by NASA's Saturn-orbiting Cassini probe along a 25-mile-long (40 kilometers) stretch of Kraken Mare's eastern shore reveal depths ranging from 66 to 115 feet (20 to 35 m), researchers said. "Scientists think that, for the areas in which Cassini did not observe a radar echo from the seafloor, Kraken Mare might be too deep for the radar beam to penetrate," NASA officials wrote about the new study. "The altimetry data for the area in and around Kraken Mare also showed relatively steep slopes leading down to the sea, which also suggests that Kraken Mare might indeed be quite deep." Kraken Mare is a huge body of liquid ethane and methane near Titan's north pole. The sea covers 154,000 square miles (400,000 square km), making it about five times bigger than North America's Lake Superior. Cassini scientists don't know for sure what these features are but say they may be waves, bubbles or some kind of floating debris. Researchers are presenting the new results this week at a meeting of the Division for Planetary Sciences of the American Astronomical Society in Tucson, Arizona. At 3,250 miles (5,150 km) wide, Titan is about 50 percent bigger than Earth's moon. The Saturn satellite is the only solar system body besides Earth known to possess bodies of stable liquid on its surface, though Titan's lakes and oceans are composed of liquid hydrocarbons rather than water. The $3.2 billion Cassini mission — a collaboration involving NASA, the European Space Agency and the Italian Space Agency — launched in 1997 and arrived at the Saturn system in 2004. Cassini will continue studying Saturn and its many moons until September 2017, when it will make an intentional death dive into the ringed planet's thick atmosphere.